The best ideas often don’t emerge from a single person – they are often the result of collaborative innovation. Hackathons bring together like-minded people who bring together different skills, tools, equipment, and experiences to celebrate creativity, innovation, and technology. I have recently returned from ExHack, a student hackathon held at the University of Exeter. Over the last 4 years, I have supported more than 45 Hackathons throughout Europe and North America through my work with Major League Hacking before joining the World Bank Group on a short-term engagement to support the Lake Victoria Challenge. 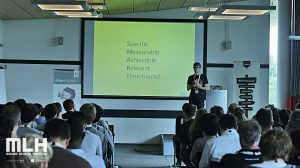 Hackathons – What are they? Hackathons are collaborative programming competitions run over a short period of time (usually 24 to 36 hours). During the event, attendees are encouraged to work in small teams to turn tech-related ideas into prototypes before pitching their projects to judges for a chance to win amazing prizes. Beyond the material goal of winning prizes, Hackathons are about a culture of building, learning, and sharing. They provide attendees with a holistic view of everything that goes into working as a team and implementing an idea from scratch. 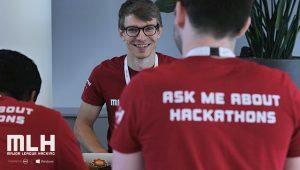 While I participated in Hackathons as an attendee during the time I worked on my MSc in Human Geography, I have since focussed more on the learning and sharing aspect of hackathon culture. Working with Major League Hacking, the official Student Hackathon League, I have traveled to over 45 Hackathons to empower, support, and mentor Hackathon organizers and participants over the last 4 years. During the events, I routinely run workshops and help attendees brainstorm ideas for their projects and debug their project code. My engagement is often in the form of informal mentorship – Hackathons are not about reinventing the wheel. Instead, it is about sharing what myself and others have learned, what worked and what didn’t and getting folks to try out new technologies. Hackathons are also great spaces for networking. The events are frequently organized by students and supported by a myriad of (tech) companies from local start-ups and initiatives such as the Digital Economy Network to global players such as Google, AWS or Dell. 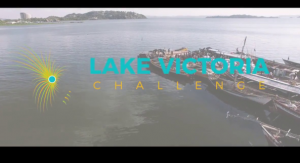 Through my work with Hackathons and my Ph.D. research focussing on the role of novel data sources in informing Urban and Transport planning in Tanzania, I have been offered the opportunity to be involved in organizing the first Lake Victoria Challenge in Tanzania. The shores of Lake Victoria are home to over 30 million people, making it one of the most densely populated areas in the world. Delivering vital health supplies and other urgent goods is often challenging due to rugged terrain, the remoteness of island communities and limited road networks. Novel technologies such as cargo drones have huge potential to alleviate some of the supply chain burdens faced by communities and businesses in the region. 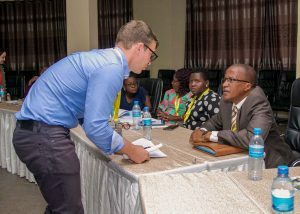 Over 280 attendees from 23 countries traveled to Mwanza, Tanzania on the shores of Lake Victoria for a three-day conference and flying competition in October 2018. 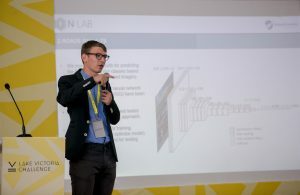 During the conference I had the opportunity to present some of the research outputs of the N-Lab’s Z-Roads project, using surveying drones and machine learning for low volume road condition analysis, as part of the LVC technology track in addition to being involved in the organisation of the event.